One Graduate Fashion Week member universities that stood out by using placard protest signs was De Montfort University. The placards held phrases such as ‘we refuse to be forgotten’, ‘one love, one garment’, and ‘diversity not division’ implying that these graduates felt strongly about social issues surrounding inclusivity. 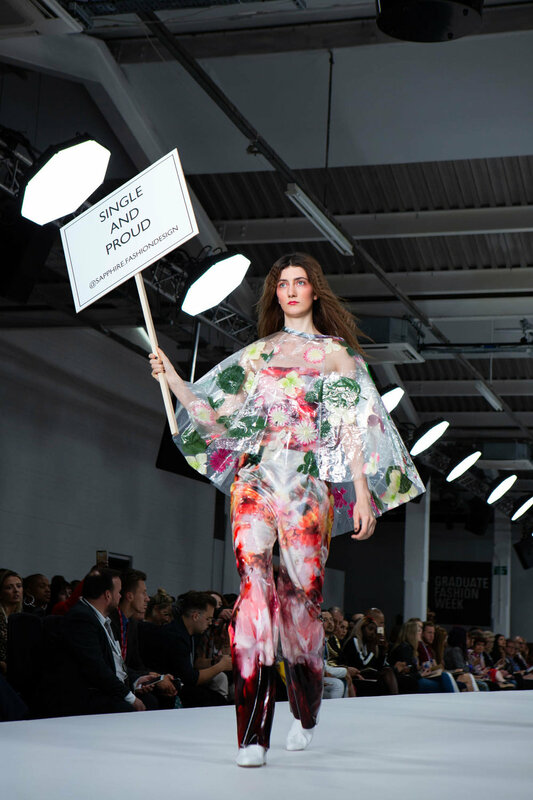 Yunrao Chen, a graduate from the University of Salford, also shared her political beliefs through a placard displayed within her collection stating ‘Just F...ing Recycle’. On the back of one of her garments reveal the words ‘Keep It Clean’ while an array of netting and plastic is dragged along the floor a clear reference to the plastic crisis in our oceans. Graduate Emily Haywards, from Plymouth College of Art, displays her protest across her garments as opposed to on a placard. Her statements read ‘like what you like, even if it’s crocs and socks’, ‘no it always means no’, and ‘make a difference’. Her collection is a statement against the injustice of conformity, referencing the importance of sexual consent along with statements of encouragement imploring us to be ourselves. These protest collections are embodiments of the social and environmental issues, we face as a society. As we continue to face these injustices, we look forward to seeing how future fashion graduates can combat this by bringing protest to the catwalk.